A Fellow of the Society of Antiquaries, William John Thoms (1803-85) pursued literary and bibliographical interests and conversed with the likes of Thomas Macaulay and Charles Dickens. Most notably, he coined the term 'folklore' in 1846 and founded the scholarly periodical Notes and Queries in 1849. This remarkable 1838 publication, dedicated to the soon-to-be-crowned Queen Victoria, is a review of British state ceremonial and court etiquette, giving details of the royal family from the queen herself downwards, with appropriate forms of address to each member, and describing the titles, history and roles of all court officials, from the Poet Laureate and the Historiographer Royal to the Clerk of the Closet. 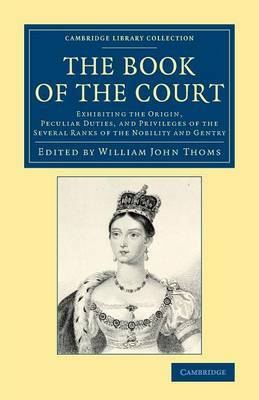 Thoms also provides an account of the coronation of Queen Anne (the last queen regnant), the official programme for the forthcoming coronation, and appendices giving lists of precedence among the peerage of Great Britain and their wives.